Cambodian Children’s Advocacy Foundation Organization (CCAFO) is very pleased to share with you all the announcement from St. Patrick’s Day - 3 Legged Charity Race 2019. CCAFO received donation from the racing for supporting the educational programs including village based preschool and English language for rural children in Kampot and Kampong Speu province, Cambodia. The 19th annual 3-Legged Charity Race takes place in Copenhagen on Sunday 17th March 2019. This unique tradition raises money for worthy causes while celebrating the Irish national holiday. Sponsored by Guinness, the event has put Copenhagen on the list of the best places in the world to celebrate St. Patrick’s Day. The Race requires skill and balance as it involves being tied at the ankle to a willing partner, also known as the 3-Legged Race. Race participants are asked to move at a steady speed and follow a route that passes through 5 pubs in the center of Copenhagen. They complete the course by drinking a half pint of beer at each pub. Race participants are asked to make a minimum donation of 75 DKK per person (150 DKK per team) to enter the race. Registration starts at 12:00 at Kennedy’s Irish Bar, Gammel Kongevej 23. Once registered, participants are asked to make their way to Axeltorv. In 2019, the Race welcomes Axelborg Bodega to join in the fun. From 12:00 to 16:00 on St. Patrick’s Day this traditional Danish bodega will get an Irish touch. The Race warm-up party starts at 12:00 and there’ll be merchandise and face-painting stalls and a real festive atmosphere as we get everyone ready to start the Race. The traditional tying of the legs will take place in the Start Pavilion outside Axelborg Bodega, from where the Race officially starts at 14:00. Even if you don’t plan on entering the race, everyone is welcome to drop by Axelborg Bodega to join the party. You can support the charity by buying your St. Patrick’s Day party hat and t-shirt or having a drink at the bar. If you are unable to attend but would still like to contribute, you can send a Mobile Pay donation. The fundraising period is open from 8th March to 18th March 2019 and 100% of the donations are given directly to the 3 charities. The 3-Legged Charity Race association is a non-profit organization, ran by volunteers from the Irish-Danish community and friends. info@paddysday.dk or telephone +45 50149814. Cambodian Children’s Advocacy Foundation Organization and Peanglvea Commune Council would like to thank you Mr. Robin Chan, Ms. Evelyn Pek, Ms. Shane Wang for your donation with the amount of 2,700.00US$ for supporting the setting up 3 new village based preschool in three difference villages including Trapeang Skun, Peanglvea and Mort Or, which they are located in Peanglvea Commune, Oudong District, Kampong Speu Province, Cambodia. 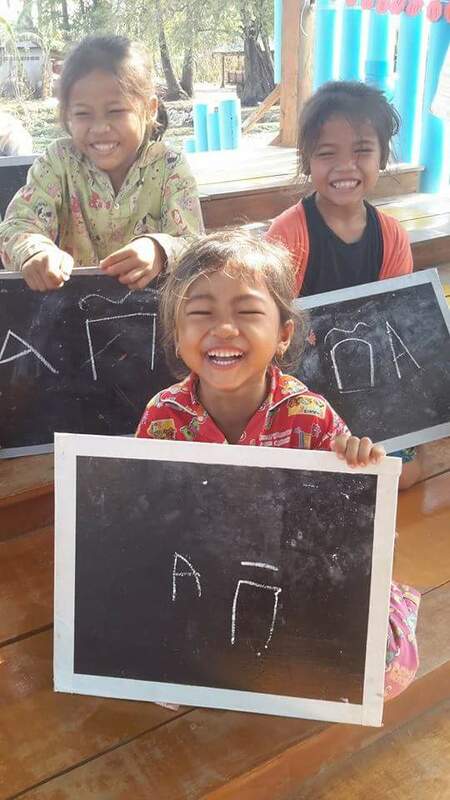 Photos: Mr. Un Noeun will be the Trapeang Skun Village Based Preschool Teacher, Ms. Kon Sokhoeum will be the Peanglvea Village Based Preschool Teacher, and Ms. Un Nath will be the Mort Or Village Based Preschool Teacher. CCAFO has received a letter from the commune council of Peanglvea Commune, Oudong District, Kampong Speu Province. They ask CCAFO to open three new village based preschools in three different villages that are located in Peanglvea Commune. CCAFO Management Team wish to request your support. You can view Concept Note, Maps and Budget Plan by click on the link on each of them. We would like to take this opportunity to thank you in advance for your consideration. Pleas let us know.